PONS change coat at about 8 - 12 months of age. During this period, they mat faster than you can brush, but keep brushing, the results are worth the effort. This is a temporary situation that lasts about three weeks to a month. Once the coat has changed grooming will be easier. 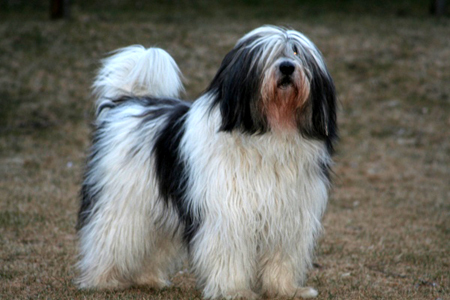 Soft cottony coats will tangle more quickly and require more care than the coarse type coat mentioned in the breed standard. The most common reason a mat occurs is dead hair that drops and becomes entangled in the coat. Never bathe a matted PON without caring to the mats, first. Dirty coats mats more easily, so be sure to bathe your dog at least every three months, but ideally once a month. The likely areas for a mat to form are around the neck and ears, underbelly area inside the legs, and under the foot pads. Never pull or rip at a mat because it will cause breakage. Would you do that to your hair? Use a cap of cream conditioner in a spray bottle. Saturate the mat and leave it for three minutes. Carefully separate the hairs with your fingers, and the mat should fall out. Work from the end of the mat backwards to the skin separating each little section and hair. It is time consuming but you will save every little hair. If a mat is dense and has significant loose hair entangled, saturate it with undiluted conditioner, and let stand for three minutes. Use your fingers to separate hairs. Many owners use a human detangling spray for children which saves hours of work with mats and tangles. It just depends on which method you prefer. To grow and maintain a beautiful coat, you will need a soft brush with flexible pins called a slicker, a rattail comb, a metal comb with wide and narrow teeth, a plastic pick--the kind with 8 or 9 teeth about 3 inches long. The amount of brushing required for an adult coat depends on the texture of the coat--the more cottony coats will require more brushing. Never brush a totally dry coat. This will cause breakage. Dampen the hair slightly with a spray bottled filled with warm water and a capful of cream conditioner or again the human detangling spray for children. The coat should be brushed out in layers from the hair ends to the roots and working from the bottom up. Never rip at the coat or lift the top of the brush away and up from the coat as you reach the hair ends. This will cause the ends to weaken and break. Instead, turn the brush into the coat and twist it downward. Use your fingers or the long toothed pick to break up tangles that the brush will not go through. Begin with the feet, legs, and belly, brushing upward to the skin. Pay special attention to the areas inside the legs and around the neck and ears where mats are more likely to form. Begin brushing the left side, right side, working up to the top coat on the back. Use a rat tail comb and part the coat from the nape of the neck to the root of the tail. Brush out tail. Brush ruff, then comb the mustache and below the ears. Pay special attention to the face and ears. Clean the inside corners of the eyes with a dam washcloth or a piece of cotton soaked in warm water. Use a comb on the mustache and below the ears. First things first, brush, before every bath brush the coat out, making sure you get all the way down to the skin, and never leave even the tiniest matt or tangle, because if you do, it will be a HUGE tangle and mat when the bath is done. I have found that a good children's detangle is a wonderful thing to use daily and before bathing to get those tiresome mats and tangle out and keep them out. Keeping a PON's whites white can be a challenge of monumental proportions, but I think these tips will help considerable. I use water bottles to for water. This helps keep their faces and a little drier. Bottled water is also a help because some waters are harder than others, and have certain minerals in them that can cause discoloration. Minerals such as iron, etc. Whitening is an ongoing grooming activity and needs to be addressed every day with daily grooming/cleaning and routine bathing. Use soda water to help remove fresh stains after each meal. Periodic bathing is very important and when a puppy or adult PON is dirty they need a bath. No one wants to be around a smelly dirty dog, and since they are a part of your home and family, you want it to be a positive experience for everyone and not one that sends everyone shrieking and running from the room when an adult PON or puppy enters. Bathe your PON as you normally do using your shampoo of choice. I do use human shampoo and then a good Whitener and brightener shampoo secondly. If the whites are extremely dirty for some reason (grass stains, rain, leaves, grit, sand, mud, and salt (which can be toxic to your PON) from winter road mixes, etc, etc., etc., in these instances be sure to use extra shampoo and work it in really really well establishing a thick lather and suds. You may have to re-wet the puppy or PON a little in this process. (Always work the shampoo from the body out in the direction of coat growth. Going "against the grain" will result in a huge matted mess you will regret, and I nor anyone else will have to explain again! A fine "jet" stream from a spray bottle will help get the shampoo deep into the coat before you begin working it into a good lather. You can get a good spray bottle at one of the Retail Super Stores, other retail stores or beauty supply stores. An extra heavy shampooing such as should remove all the dirt and will go a long way to helping remove some of the staining on the white areas of the dog. Lather the PON and work the shampoo in for about 8 - 10 minutes then rinse your dog really well with warm water to ensure that all the shampoo is out and the coat is again thoroughly wet down to the skin. Be sure the water is not to hot and burn your little fur baby. Check the temperature on the inside of your wrist. It should be warm, but not hot or cold. Cold water tends to close the hair follicle and "seal it up and hold the stains in. Step two is much the same as the first except you want to use a brightening and whitening shampoo. Using a dedicated whitening shampoo made to remove stains and rewash the white areas. There are multiple whitening shampoos from which to choose. If you are using a dog shampoo for the regular cleaning, chances are that the same company makes a whitening shampoo and that should be your first try. Whitening shampoo from the same brand name as the general cleaning shampoo should ensure compatibility and prevent any irritating or allergy triggering reactions. This is not common, but it doe occasionally happen. Watch for reddening skin, (more than usual with bathing, rashes, skin scratch, etc.). If, you use a good quality human shampoo (I particularly like the Aussie products available at most retailers) for regular bathing, try any whitening shampoo as your first choice. I have had particular success with Cardinal Gold Medal Blue Diamond Shampoo available at Petsmart and the Coat Handler brand of shampoo available online. Also Pet Edge offers a wonderful selection of shampoos and certain ones will work better for the stains your PON (It never ceases to amaze me that a blue shampoo can make things brilliantly white.) Apply the shampoo and work it in thoroughly and in accordance with directions let it sit for a time. Cardinal recommends 5-10 minutes, I give it 10 minutes and often 12-15 for particularly stubborn stains. Once it has "processed" for the recommended time rinse the coat clear of shampoo and complete the bathing with a good conditioning treatment. I also use a good human leave in conditioner that I mist on just before blow drying. (The whites can be conditioned as they are naturally a softer coat texture than the grizzle but be careful not to soften the coarse coat if you are showing. Make sure the coat is thoroughly dried before letting your now clean PON loose. A wet coat will stain incredibly quickly and those stains set in more stubbornly and quickly if the coat is wet when he stain happens. Taking the time for daily whitening can be accomplished in short order and goes along way in keeping pristine coat. Around the face and beard area which typically gets very wet while drinking and stays at least damp the white beard can stain from pink to a dark brown depending on how "wet mouthed" the dog is, how much water he/she gets and how sloppy an eater he/she is. After brushing out the beard and affected upper chest area the coat can be sprayed with a hydrogen peroxide or lemon water solution. I like the peroxide for speed and "intensity" of results. Be cautious though not to wet the coat down to the skin as peroxide will dry the skin and may even cause burning if enough gets on the skin directly, especially if there is food debris or dirt on the skin with which it will react. If this occurs immediately rinse you pet with cool water until all shampoo or peroxide is gone. Generally about 8 - 10 minutes. CAUTION, DO NOT get this in your adult PON or puppy's eyes! Once the peroxide has finished processing with the protein part of the stain (foaming and heating stops) rinse the area with a damp face cloth and dry thoroughly. The beard will now be free of food debris and much whiter than when you started. If the coat is not quite dry enough corn starch is a good additive. I use the Cornstarch baby powder, and you can apply it with a makeup brush or small eyebrow brush. It both dries any remaining moisture and whitens the hair. Another more subtle method is baking soda mixed with a small amount of water to make a paste and then rub into the stained white areas will assist in the removal of some stains. This will not be as ultimately effective in removing large or dark stains as the peroxide, but it is gentler to the coat and less drying to the skin. As well this mixture will not heat up like the peroxide, but again it is less effective. Also available if the coat is essentially clean are a variety of chalks and/ corn starch are available where you purchase show supplies. (Cherry Brook) These are specific blends of chalks ground to very specific consistency for use in the show ring. They have no cleaning properties at all but cover up or mask stains. Also a little mink oil spray available at most retail stores in the shampoo sections gives them that "Show Glow"! Use sparingly or you will have a oily coat! Of course a pound of prevention is far better than cure than trying to correct the problem afterwards. By limiting your PON's access to outside factors such as mud, rain, grass, etc. you will substantially help in keeping him/her bright, white and clean, but after all they are dogs and they love to be outside and play and by the perverse laws of fate, which guide children and dogs they are only interested in these things when freshly bathed! Once our little beauties are dirty again these items are of absolutely no interest whatsoever to them and they will disdainful walk around them or refuse to walk in them at all and insist on being carried! I have mentioned and general places they can be found.